januari 2016 | 398 blz. 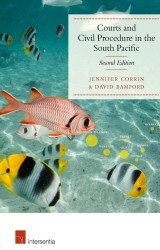 This book outlines the conduct of civil litigation in the South Pacific. It focuses on the superior courts of Fiji, Kiribati, Samoa, Solomon Islands, Tonga, Tuvalu and Vanuatu. It discusses relevant case law and legislation and suggests possible reforms.